Choke cable will not retract the jets. I can move the assembly and retract the jets by hand from under the hood but can't pull the choke cable out far enough to retract the jets from inside the car. I've lubed up everything to no effect. Any hints? Remove the jets and polish the outer surfaces to a mirror finish. If still too hard then double check the linkages and cable routing. If still too hard, check the run of the cable for crimps, tight bends, or too-tight mounting clamps. Finally...if still not working, remove the entire cable assembly and disassemble it, taking care not to loose the locking key. Fully clean the inner cable with fine wire and reassemble. By step four above you will have a choke that works like cutting cheese! +1 on polish the jets. 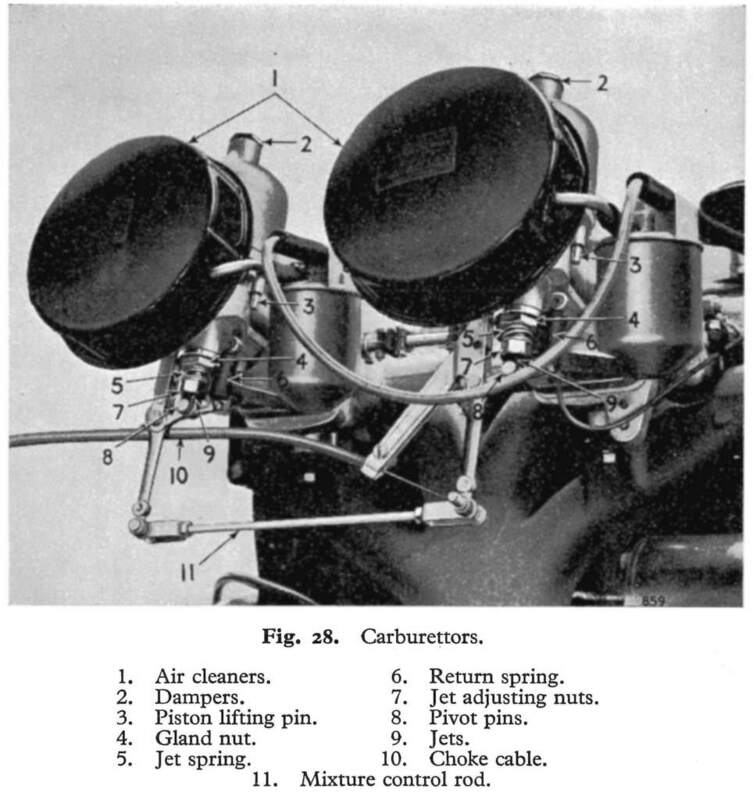 All John's other suggestions are good, too, but dull jets seems to be the most common problem. Best I can make out, the originals were supplied slick, but modern replacements are supplied with a more matte surface that really drags against the glands. Any fine abrasive will do to polish them, I've even used white toothpaste. Obviously clean away all traces of whatever you use before reinstalling. Note that the linkage goes together in a non-obvious way. The two clevises on the link between the carbs don't straddle the arms, but instead hang out on one side. Seems crazy, but does work better that way. The joints all have to have a small amount of slop in them. If by chance you (or the DPO) has substituted bolts for any of the pins, they have to be left loose. Choke cable needs to be the type with a stranded inner core. If all else fails, disassemble the jet housings and check that the cup washers are turned the right way (the cupped side goes towards the seal). I would also replace the springs if I didn't know their history, since it's not uncommon to find that someone has stretched them trying to get the glands to seal. Does the cable pull smoothly and easily when it's *not* connected to the carb mechanism? Yes, The cable is new as are the jets and all the bits in the bottom of the carbs. The assembly moves without restriction until the jets must move and then no matter how hard I pull on the knob, I'm not able to move the jets. I didn't have this problem before I rebuilt the carbs and replaced the cable. I also didn't realize the clevises are outboard of the arms. The problem is that I can only pull the choke out about 3/4" but it won't stay. The springs will retract the cable and the knob returns all the way to the dash. A focused, close up photo of the connections will help. Also, disconnect one of the return springs, and see if the system pulls the jets down (and back up) properly. After I polished the jets as Randall mentions, I found that only one spring was sufficient to pull both the jets back up fully. I had a problem with the choke cable not retracting the jets. It turned out to be that the cable outer case was sliding into the part that is secured to the dash. The crimp was not securing the outer part of the cable. It was also a brand new cable all be it bought in 1998 but still in the bag. As I pulled the choke out I noticed the loop in the cable under the dash would straighten out then return to a loop if I pushed the choke back in. I crimped a steel cable thimble ob the outer sleeve to stop the outer sliding into the dash part. That would be a separate problem. The locking mechanism in your choke cable must be worn out (or missing) as well as whatever is keeping you from pulling it out farther. IIRC, the factory version has a piece of brass shaped kind of like a Woodruff key. There is a spring around the outside that holds it against the shank, which should have notches in it. But there are others. With some of them (like the aftermarket cable I use), you turn the knob to lock the shaft in place. On the original chokes the knob turns to the right to release and when pulled straight it clicks. The travel on the cable is small. Just look at how much cable is exposed before the inner cable bottoms out on the holding arm. I am thinking you bottoming out your choke travel before the choke pulls down the jets. Try putting some preload on the cable and some preload on the lower arms to cheat some more travel out of the cable by taking up the slop. I've ordered an original style cable from Moss since I've frayed the end of the replacement cable I was using. Besides, the replacement cable did not have stops and a release. You had to hold it out while pressing the stater. A real pain especially since it did not retract the jets. When I get the new cable I'll try to set up the whole thing the way it was meant to work. The pin on the rear clevis is not long enough to allow the the clevis to straddle the arm. There is no problem with front pin. Do they make a longer pin for the rear? Weird. All the vendors seem to have the original part number 108326 cross-referenced to a shorter pin. Revington shows it crossed to a 9/16" pin, TRF shows 31/32". But the official cross-reference I have is silent (meaning they didn't know of one). Just in case you did not know, I put the pin on the cable first and the have the brass arms pointing straight down and the push arms back a bit and then the pin through the hole in the arm. That way I do not have to fiddle with cable and all-- at once. This puts a little preload on the arms too. I hook up the out sheath last. The picture of just the pin and arm is 180 out, so after the pin is clamped; I roll the pin over and, put it in from the fender side. Polishing the jets with a household brass cleaner did the trick. I think the replacement seals offered by Moss instead of the cork seals may be more restrictive. The action on the choke is still not as free as I would like but it does work now. The car starts cold without a problem. Thanks for all the help. Yeah, it's always a little hard to pull, in my experience. I kind of prop my ring finger on the dash, and twist my wrist to pull the knob out. Didn't particularly notice any difference when switching from cork to O-rings, but YMMV. I can easily pull mine out with one hand, but yes there is resistance from those big return springs. Does your choke click and lock ---then release by turning to the right? No. I bought an original style cable from Moss but it doesn't lock in the choke position and wants to return because of the springs, so you have to keep it pulled while pressing the starter. It's a two hand operation. Maybe I'm not able to pull it out far enough for it to lock. I remember the first choke cable I had and it did work like yours. It locked and then released by turning it. Don't know why the cable sold by Moss shouldn't work that way. It wasn't cheap. I had a cheaper cable before this one and it worked the same as this one does but didn't have the thingy (???) that held the original knob. It came with its own knob without writing on it.